Linh Ngo has created this wall mounted gun rack that’s concealed behind a lift up panel. A video of his creation is here. 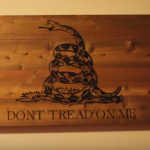 His panel is a woodburned mural on a piece of cedar of the classic “Don’t Tread On Me” flag. This could be substituted for any number of paintings, collages, photos, etc. The wooden storage box sits out from the wall, so it’s not 100% hidden. However, most people would not suspect what was inside. When you push on the front panel, internal gas shocks lift the front panel up revealing space inside for up to four long guns. A switch on the door turns on two LED light bars when opened. 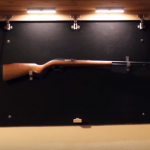 Overall this is a simple way to store guns out of site, and it could be secured with any of several types of locking mechanisms.